Can't make it? You can still show your support with a donation! I have read and agree to the Terms and Conditions and give my consent to PAWS NY to process my personal data. I understand I can revoke this consent at any time. 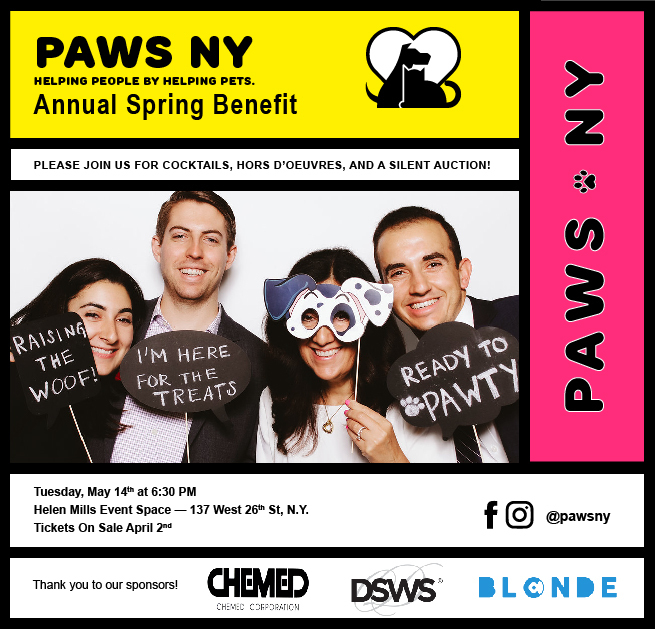 in celebration and support of PAWS NY's mission to keep people and pets together! for giving out hugs to New Yorkers all around the city! *Includes early access to event with VIP reception starting at 6 pm with bubbly! Make a Donation! Can't make it? You can still show your support with a gift. Silent Auction: Bidding will open on Tuesday, April 30th! Thank you to our amazing event committee!